If you’re a beginner in poker the No Limit Texas Hold’em Tournaments by Issa Jouaneh is a book perfect for you. If you’re a more advanced player looking for some new poker concepts this one isn’t for you. This book is aimed at beginners but that doesn’t mean it’s of poor quality. On the contrary actually, this book is a fantastic read for all new or new-ish players. No Limit Texas Hold’em Tournaments will give players some much needed guidance and teach them how to develop winning Tournament poker strategies in a way that is easy to get to grips with and understand. During tournament poker there are three fundamental strategies that players employ (more advanced players will use combinations of all of these and much more but new players shouldn’t try this yet). You can either play loose aggressive (play many hands and bet big), moderate (limp in cheap and play tight on the flop and tight aggressive (play only premium hand with big strong bets). Issa Jouaneh’s book is mainly aimed at the tight aggressive tournament strategy. This is the strategy that we at PokerHarder UK recommend for new players as this is the most effective way to learn patience and discipline at the same time as giving you a good chance to make money on the hands you choose to play. A lot of other poker books and online articles focus on loose aggressive poker so we think this book is especially good for that reason. You will learn the best long term strategies for winning tournament poker and Issa will teach you how to allow luck to help you achieve success in poker tournaments. You will learn to play like a professional and you can go on to use your new found skills at the poker tables. 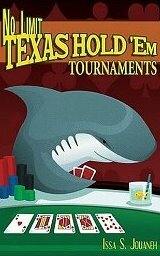 No Limit Texas Hold’em Tournaments is a short book at only 83 pages, this makes it an easy read that will give you valuable information on improving your success in playing poker tournaments. PokerHarder UK most certainly recommends No Limit Texas Hold’em Tournaments by Issa Jouaneh to you.